I was born to a farming family in North Norfolk and educated at King Edward Vll School in Norwich, after which during a year out qualified as a Butcher at Norwich City College. I then studied Agriculture at the North of Scotland College of Agriculture for three years before moving on to do a post graduate in Farm Business Management at Seale-Hayne in Devon. I have worked for the family firm all my life, during which the farming business has seen some dramatic changes that have resulted in a large increase in contract farming arrangements with 27 local landlords. The butchery business has also grown from one shop and slaughterhouse to four shops and two EEC licences cutting units. 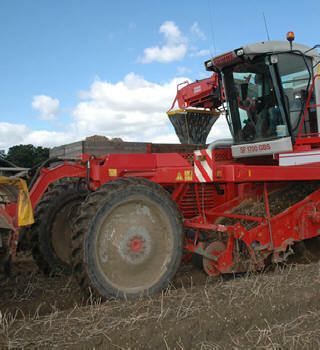 As a Director of L F Papworth Ltd, the contract farming business, my responsibilities cover all aspects of potato and vegetable production, marketing, livestock supply and selection, haulage and transportation, input purchases and human resources. In 2007 the business was awarded an Environment Agency water efficiency award, in 2010 the Bayer Countryside Careers accolade and the Norfolk Farms Championship in 2009 and 2014. Potato production covers the crisping, chipping, processing, fresh and salad sectors, which are marketed through Branston, QV Foods, Preva Produce, McCain’s and Nelson County Potatoes. 11 varieties are grown on 350 acres, and a further 150 acres are lifted under contract for Spearhead. Vining Peas are grown for Anglia Pea Growers and the Aylsham Growers cooperative, where we also grow Dwarf Beans and Maize for Anaerobic Digestion. Carrot and onion land is let out on an annual basis when suitable. I am FACTS and BASIS Soil and Water qualified and undertake 27 soil management and nutrient management plans for the business. I am also very involved in local community work, as Life Vice President to the North Walsham Young Farmers Club, a Parish Councillor in the Felmingham ward, a Director of The Clan Trust. I also host a number of farm walks annually for local schools as well as being involved in the Holt Farmers 6th Form student day and have taken my CEVAS course, last year we opened for Open Farm Sunday and had 700 visitors. Other interests include Stewarding the Grand Ring Displays at the Royal Norfolk Agricultural Show and I am actively involved as a member of the Stalham Farmers Club as well as the Norfolk Mardlers, a discussion group with agricultural interests. In 2007 I was appointed onto the Potato Council Board which has been both interesting and rewarding during a period of significant change with the sector companies relocating to Stoneleigh and becoming part of AHDB, my term finished there in 2014. I started on the National NFU Board for Horticulture and Potatoes in 2009 and have just been re-elected for another term. I have chaired the NFU Potato Forum since its creation in 2010, and have recently been elected Chair of East Anglian Horticulture and Potatoes. My interests in water further extend to being a committee member of our local abstractors group BAWAG, a member of the UK Irrigation Association and sit on the Executive Council, member of the NFU Water Resources Group, I am also a member of Cambridge University Potato Growers Research Association, member of Potato Council Marketing Strategy Committee, and a Board member of Red Tractor Fresh Produce Board. During any spare time I have I enjoy all aspects of horsemanship with my wife Emma and three children as well as shooting and skiing, weather permitting!